Venus and Mars are drawing together very gradually as the season advances. Upper right of Mars, can you resolve the orange double star Alpha (α) Capricorni naked-eye? Binoculars will do it easily. The last-quarter Moon hangs with Regulus at dawn on the 21st. The Moons in these diagrams are always positioned exactly for an observer in the middle of North America. For clarity, the Moon is drawn three times its actual apparent size. As the Moon wanes further, it passes Gamma (γ) Virginis, Jupiter, and Spica in early dawn. 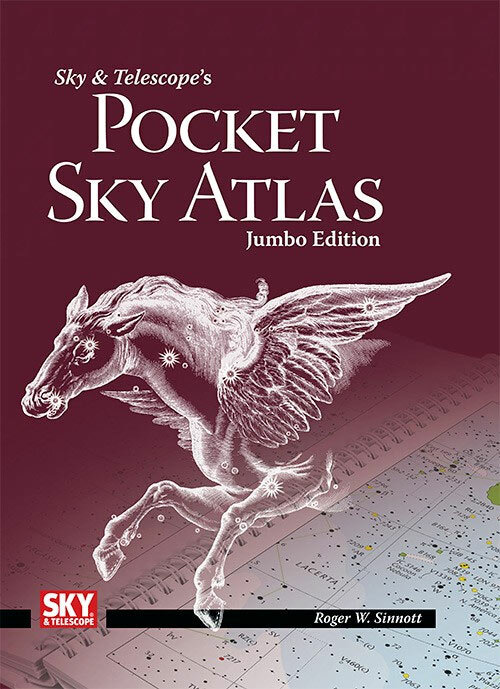 • Around 7 or 8 p.m. this week, the Great Square of Pegasus stands in its level position very high toward the south. (It's straight overhead if you're as far south as Miami.) The Square's right (western) side points very far down toward Fomalhaut. Its eastern side points down less directly toward Beta Ceti, less low. If you have a very good view down to a dark south horizon — and if you're not much farther north than roughly New York, Denver, or Madrid — picture an equilateral triangle with Fomalhaut and Beta Ceti forming its top two corners. Near where the third corner would be is Alpha Phoenicis, or Ankaa, in the constellation Phoenix. It's magnitude 2.4, not very bright but the brightest thing in its area. It has an orange tint (binoculars help). Have you ever seen anythingof the constellation Phoenix before? • Pulsing stars in Cepheus: High overhead, follow the naked-eye changes of famous Delta Cephei, and the telescopic changes of obscure T Cephei, using the charts and article in the November Sky & Telescope, page 48. 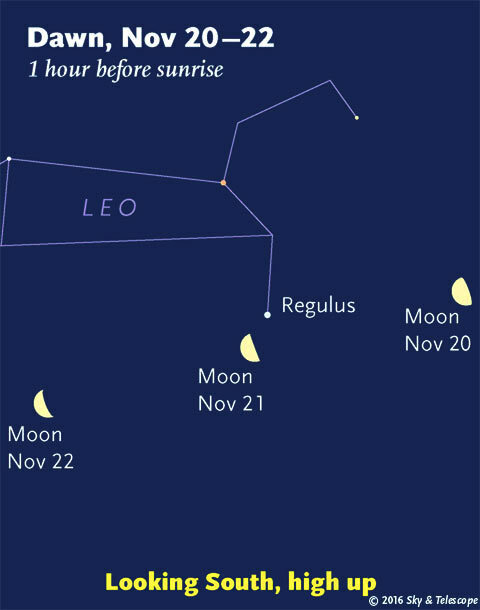 • The last-quarter Moon rises around 11 or midnight, with Regulus accompanying it just a couple degrees to its left (for North America). They stand together high in the south by early dawn Monday morning the 21st, as shown at right. • Whenever Fomalhaut is "southing" (crossing the meridian due south, which it does around 6 or 7 p.m. this week), the first stars of Orion are just about to rise in the east, if you're in the world's mid-northern latitudes. And the Pointers of the Big Dipper stand upright straight below Polaris. • With the Moon gone from the evening sky, explore the deep-sky sights of northern Lacerta high overhead using Sue French's Deep-Sky Wonders column, chart, photos, and drawings in the November Sky & Telescope, page 54. • We're two thirds of the way through fall, so Capella is shining in the northeast as soon as the stars come out. As night grows darker, look to its right by about three fists at arm's length for the frosty little Pleiades cluster. It's the size of your fingertip at arm's length. • Two faint fuzzies naked-eye: The Andromeda Galaxy (M31) and the Perseus Double Cluster are two of the most famous deep-sky objects. They're both cataloged as 4th magnitude, and in a good sky you can see each with the unaided eye. They're located only 22° apart, very high toward the east early these evenings — to the right of Cassiopeia and closer below Cassiopeia, respectively. To find exactly where to look, you'll need a good sky chart. The all-sky constellation chart in the center of theNovember Sky & Telescope will do just fine. • Does the Sun already seem to be setting about as early as it ever will? You're right! We're still about a month away from the winter solstice — but the Sun sets its earliest around December 7th if you're near latitude 40° north, and right now it already sets within only 3 minutes of that time. A surprising result of this: The Sun actually sets a trace earlier on Thanksgiving than on Christmas — even though Christmas is around solstice time! This offset is made up for by the opposite happening at sunrise: the Sun doesn't come up its latest for the year until January 4th. Blame the tilt of Earth's axis and the eccentricity of Earth's orbit. • Dawn triangle: Before and during dawn Friday morning, look southeast for the crescent Moon forming a triangle, 9° tall, with Jupiter and lesser Spica, as shown above. 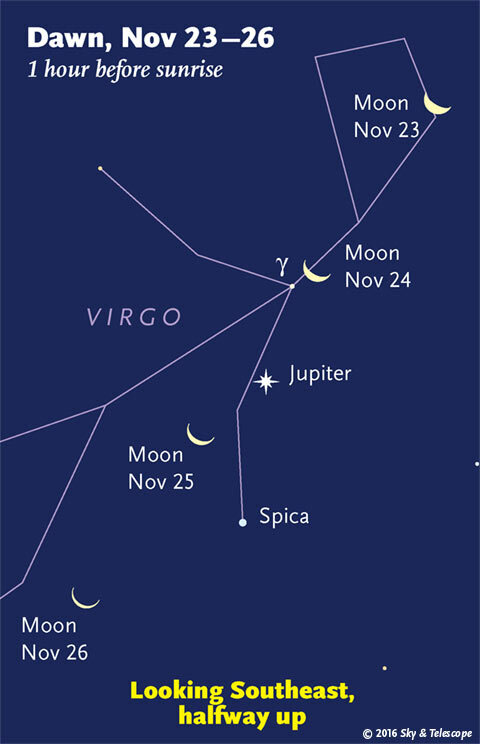 • Before and during dawn Saturday, the thinning crescent Moon in the southeast is at the bottom of an arc that it now forms with Spica and, on top, Jupiter. See the last illustration above. • The naked-eye eclipsing binary star Algol should be at its minimum brightness, magnitude 3.4 instead of its usual 2.1, for a couple hours tonight centered on 12:13 a.m. EST; 9:13 p.m. PST. • By 10 or 11 p.m. now (depending in how far east or west you live in your time zone), the dim Little Dipper (Ursa Minor) hangs straight down from Polaris. By that time, Orion has risen high in the southeast and Sirius blazes below it. Next up is the larger and deeper Sky Atlas 2000.0, plotting stars to magnitude 8.5, nearly three times as many. The next up, once you know your way around, is the even larger Uranometria 2000.0 (stars to magnitude 9.75). And read how to use sky charts with a telescope. 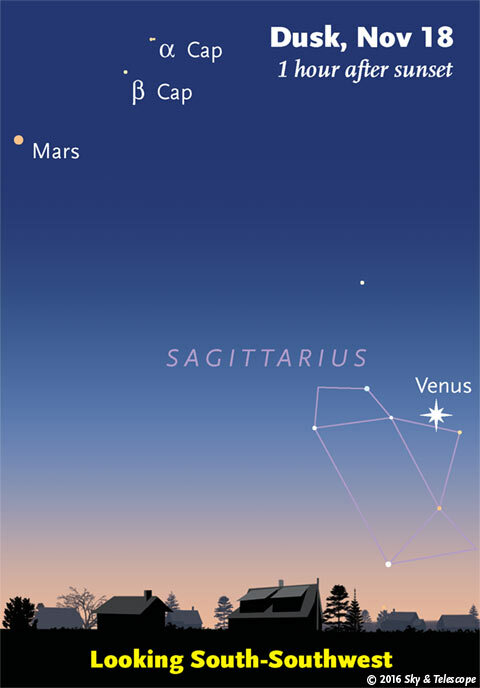 Mercury (magnitude –0.5) and Saturn (magnitude +0.5) are hiding very low in the glare of sunset. Try for them with binoculars or a low-power, wide-field scope about 15 minutes after sundown. Look about 35° to the lower right of Venus. Venus (magnitude –4.1) shines brightly as the "Evening Star" in the southwest during and after twilight. Mars (magnitude +0.5) still glows in the south-southwest at dusk, about 25° or 30° upper left of Venus. In a telescope, Mars has shrunk to a mere 7 arcseconds in diameter. Jupiter (magnitude –1.7) shines brightly in the southeast before and during dawn. Look for Spica about 10° under it. Uranus (magnitude 5.7, in Pisces) and Neptune(magnitude 7.9, in Aquarius) are high in the southeast and south, respectively, in early evening. Info and finder charts.